1/4 cup of dried cranberries for garnish before baking. Combine the cereal with 1/2 cup of milk and let soften for about 15 minutes. Whisk orange juice, applesauce, oil, egg, sugar, and remaining milk then add cereal and milk mixture. Sift in flour and baking powder. 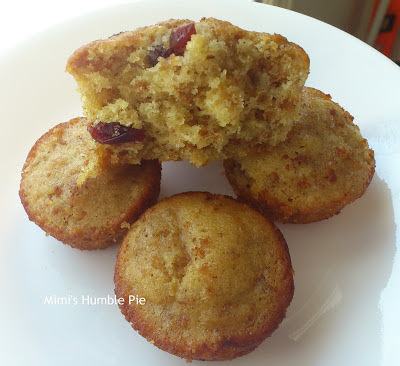 Pour into baking tins and add a couple dried cranberries to each muffin before baking. Makes 8 large muffins or 24 mini muffins. Add frozen muffins to lunch bags and they will be thawed in time for lunch! I'm a member of the Kellogers Blog Team and occasionally receive perks for my involvement.